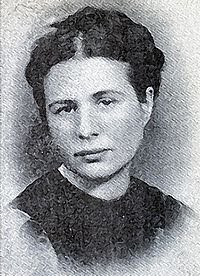 Irena Sendlerowa (known in English as "Irene Sendler") was a social worker in Poland who was among the tiny minority of Polish Catholics who took direct action to save those trapped in the Warsaw Ghetto from death at the hands of the Nazis during the German Occupation of Poland (1939-1944). Specifically, she headed a group of individuals known as Źegota; approximately two dozen of whom cooperated in the salvation of some 2,500 Jewish children from the Warsaw Ghetto. For her efforts, she was captured, tortured, interrogated, had all four limbs broken, and was sentenced to death–escaping only when her designated executioners secretly cooperated with the Polish underground to enable her escape. Poland's long history of anti-Semitism has many bitter incidents to its history, long before the arrival of the German army in 1939. But through that long night of bigotry, many names shone who resisted the popular prejudice against the Jewish people. One of those resistors was Irena Sendlerowa. Her Catholic father, a physician, died in 1917 of typhus, contracted from treating his Jewish patients, who were suffering from an epidemic in that dark time of the First World War. Others would have used that as an excuse to become anti-Semitic. Irena, on the other hand, remembered her father's sacrifice and became a Judeophile in a land where Jews were held as a bitterly hated and feared minority. She first showed her courage during the so-called "Ghetto Bench" controversy when in university in the 1930s. In those dark days between the wars, Poland was a dictatorship, run by a shadowy coalition called Sancja ("Sanation" or "The Healing Coalition"), under the iron fisted rule of Jozef Pilsudski, the general who, holding various high political offices, was the true ruler of Poland until his death in 1935. After his death, "Sanation" split into three weak parties as Poland tried to come to terms with the growing Nazi threat to its west. During this period, German anti-Semitism found a dark echo among students in Polish universities. This resulted, starting from the death of Pilsudski, with demands among nationalist students that Polish Jews in the universities be forced to sit apart from the main body of students, to the left hand of each lecture hall. Organized harassment of Jewish students by nationalists became an ongoing problem, particularly as those running the universities, jealous of their independent status, would not allow local law enforcement to intervene to stop the beatings. Starting in December 1935, Lwow Polytechnic instituted a policy whereby Jewish students were forced to sit in these "Ghetto Benches." Jewish–and Catholic–students who resisted the order were ordered suspended, then expelled from the Universities, in the name of "preventing violence." Irena Sendlerowa thought the system unconscionable. As a result of her refusal to submit to this organized humiliation of a minority, she was suspended from Warsaw University. When the war broke out, she was working as a social worker in the countryside surrounding Warsaw, and watched in horror as the Germans began to segregate the Polish Jews–first by expelling professional Jews from their work and ordering all to wear a Star of David, then, more ominously, by forcing them to live in a segregated area, the Ghetto–as it developed, the largest in Europe. The Germans coopted the local Polish city government bureaucracy, and Irena was given an assignment almost unique among Polish Catholics. She was ordered to enter the Ghetto on a regular basis to monitor the appearance of typhus and other diseases–not because the Germans cared if the Jews of the ghetto got sick (they didn't) but because they feared its spread to the civil populace in the rest of the city. She therefore had special papers allowing her to come and go freely in the Ghetto. While she was inside its walls, she freely chose to wear the Star of David on her arm–both out of sympathy and solidarity for those confined there and out of a desire not to be conspicuous. What nobody at the city bureaucracy had noticed was that Irena had made contact with the Polish underground. The Polish underground during the war was actually many "undergrounds." Although most were associated with the Government-in-Exile in London, some were Communist controlled; furthermore, there was much internal division even among those under the London Poles. Most were dedicated to armed resistance against the Germans and thus had few resources (and even less desire) to assist the Jews caught in the grip of the Nazis. Irena, however, joined a small group, known today as Źegota, the Committee of Aid to the Jews. As part of that group, she began to organize a quiet underground of some two dozen people to assist the Jews in their time of darkest need. In 1941 and 1942, she commenced an organized effort to remove children from the Ghetto and place them in surrounding farms and families, with convents and parishes. While it was the policy of many to convert Jews in their care to Catholicism, she was determined that these children would retain the birthright of their identities once the war was over. Accordingly, she kept the names of the children she hid, the names of their families, and the places they were hidden in buried jars, so that when the war was over she would be able to reunite them with their birth families. Furthermore, she made specific promises to these children she cared for that they would one day, if possible, be reunited with their parents. In 1943 the Gestapo captured her, tortured her severely, and sentenced her to death. She was taken to the woods outside Warsaw, where her executioners, possibly having been bribed by Źegota operatives, forewent shooting her, instead beat her severely and left her for almost-dead, breaking both her arms and legs. She was rescued by the Underground and assumed a new identity until the war was over. The Germans listed her among those executed. The end of the war came and she kept her promise; she dug the jars up and used the information to try to reunite the children with their parents. Alas, however, the parents were almost all killed at Treblinka death camp. Her work with Źegota was recognized by the new Communist regime: as an agent of the London based Government in Exile, she was declared an enemy of the new Polish state. During this post war period, she lost a child to miscarriage. In 1965, however, Yad Vashem had obtained enough information to verify her status as one of the Righteous Among the Nations. She was not allowed to travel to Israel to receive recognition for her wartime work until 1983. In 2003 Pope John Paul II sent [Sendlerowa] a personal letter praising her wartime efforts. On 10 October 2003 she received the Order of the White Eagle, Poland's highest civilian decoration, and the Jan Karski Award "For Courage and Heart," given by the American Center of Polish Culture in Washington, D.C..
On 14 March 2007 [Sendlerowa] was honored by Poland's Senate. At age 97, she was unable to leave her nursing home to receive the honor, but she sent a statement through Elzbieta Ficowska, whom [Sendlerowa] had saved as an infant. Polish President Lech Kaczynski stated she "can justly be nominated for the Nobel Peace Prize" (though nominations are supposed to be kept secret). On 11 April 2007, she received the Order of the Smile[, an international award recognizing adults who performed special acts of heroism on behalf of children] as the oldest recipient of the award. In May 2009, Irena [Sendlerowa] was posthumously granted the Audrey Hepburn Humanitarian Award. The award, named in honor of the late actress and UNICEF ambassador, is presented to persons and organizations recognized for helping children. In its citation, the Audrey Hepburn Foundation recalled Irena [Sendlerowa]’s heroic efforts that saved two and a half thousand Jewish children during the German occupation of Poland in World War Two. In 1999, a group of high school students in Kansas were inspired to write and perform a play based on her life, entitled A Life In A Jar. This has led to the creation of The Irena Sendler Project, an ongoing educational program to teach children about the Holocaust. The funds raised by this project are being used to raise a statue to her memory in Warsaw in 2010, the 100th anniversary of her birth. The best monument to her efforts remain the children she saved. Although they are not remembered as a collective in the way the Schindlerjuden are known, their numbers are even greater than Oskar's accomplishment. Generations will thrive because of her efforts. Her work with the Warsaw Ghetto children was truly worthy of honor. I must admit, however, that I am almost more impressed with her willingness to resist the segregation of Jews in her university days. One small advantage of resisting tyranny such as Naziism is that the evil is naked and undeniable, with life and death and salvation and damnation all clearly at stake. But who would risk expulsion in this day and age from university studies over a matter of principle? In the end, only one award, alas, eluded her. In spite of Lech Walensa's and others' enthusiastic support for her nomination that year, the 2008 Nobel Peace Prize was granted to Albert Gore, Jr., a noted science fiction/fantasy film maker.